I'm creating a voting form for a contest held at my company. I'm having some spacing issues. Basically the format goes: title, image, copy, title, image, copy, title, image, copy and so one for each of our contestant. I need to add space between the copy for 1 contestant and the title for the next contestant. How do I add space between? I tried the hidden box, thinking it might add space, but it doesn't. Also, as previously mentioned, we are adding a voting component..how do I go about implementing this into the form? 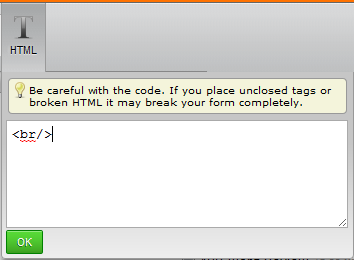 After adding, click on the HTML button found in the toolbar, type <br/> then click OK. You may type as many <br/> as you want. Alternatively, you may type <hr/> instead to insert a horizontal line separator. For your second question, please open a new thread for it because it seems to be unrelated to the main topic in this one (spacing).